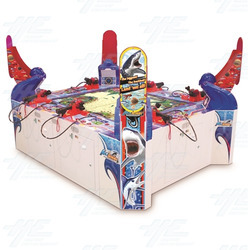 Ace Angler is a fishing simulation arcade machine from Namco in which up to six players must try to catch as many and as tough fish as possible to earn maximum points, using the force-feedback simulation fishing rods! Fish appear as shadows until they take the bait, at which point they become fully visible. Players use the rod controllers to catch fish as they swim around the large game screens and win points based on the class of fish and where it lands. HOW TO PLAY: 1. Use the fishing rod to cast your float. 2. When a fish takes the bait, wind the reel to pull it in. 3. If the fish is a bit tougher, players can spend a point to use the Thunder Bolt feature to weaken the fish. 4. Land the fish to get points! There are over 50 types of fish arranged into five classes: - Normal Class (2-10pts) - Super Class (10-22pts) - Special Super Class (10-22pts) - Gold Class - fish appear golden (30-35pts) - MONSTER CLASS - at the end of each stage, huge "Monster Class" fish appear (100pts) There are also three kinds of rods for players to use, which can be purchased with points: - Normal Rod (costs 3pts) - Super Rod (costs 5pts) - Monster Rod (costs 7pts) Each road has an effect on the bite rate and catch rate for the various fish shadow types. The ability to purchase different rods gives players a sense of customization. There are also three stages which have different types of fish for players to catch, and switch every eight minutes, including: - The Coral Reef stage. - The Blue Hole stage. - The Underwater Ruins stage. Fish appear as shadows until they take the bait, at which point they become fully visible. Players use the rod controllers to catch fish as they swim around the large game screens and win points based on the class of fish and where it lands. 1. Use the fishing rod to cast your float. 2. When a fish takes the bait, wind the reel to pull it in. 3. If the fish is a bit tougher, players can spend a point to use the Thunder Bolt feature to weaken the fish. 4. Land the fish to get points! Each road has an effect on the bite rate and catch rate for the various fish shadow types. The ability to purchase different rods gives players a sense of customization. 2x 55" LCD screens for an ultra-widescreen experience! Uses hgih performance ES1 circuit board! Three unique stages that change every 8 minutes! 50 types of fish to catch across three stages! Five classes of fish and three types rods suited to those classes! Thunder Bolt feature helps players catch tougher fish! Just press the button on the rod controller to deliver an electric shock! Force feedback rod controller - vibrates when fish take the bait! Game requires online connectivity through NBLine router to play.